Posted 4/28/2011 12:03pm by Neil Stauffer. We still have some 24 week Harvest Shares available. This share begins in the first week of June and runs until just before Thanksgiving. We will take new members until May 31st or until we are sold out. Sign up for yours now before it's too late. Click here to view the showcase. Check out our weekly CSA Blog full of recipes and stories about our farmers! Contact us for more information about our cooperative! 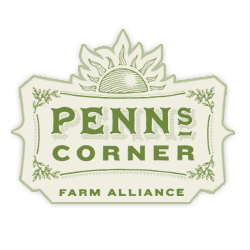 All content property of Penn's Corner Farm Alliance.